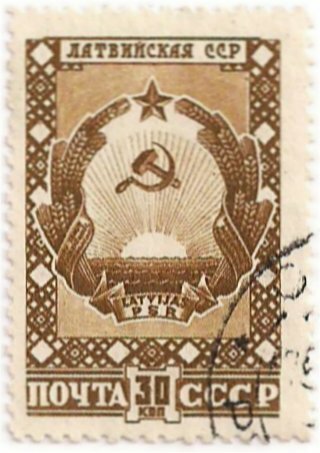 The first Soviet postage stamp with a Latvian motive, issued February 9, 1947. 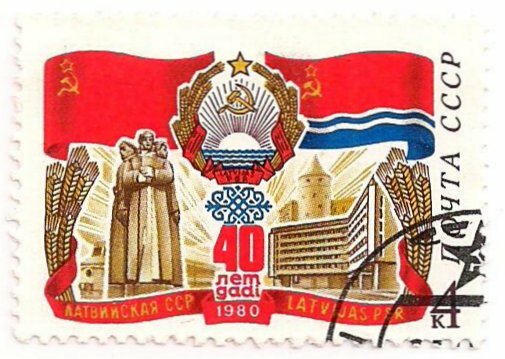 In the series with arms of the Union Republics, a stamp is also dedicated to the Latvian Soviet Republic. 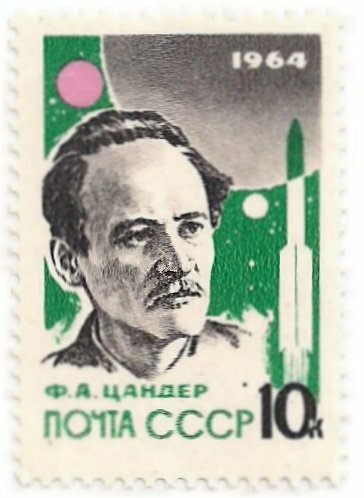 At the top is the indication Латвийская CCP, Латвийская Советская Социалистическая Республика. 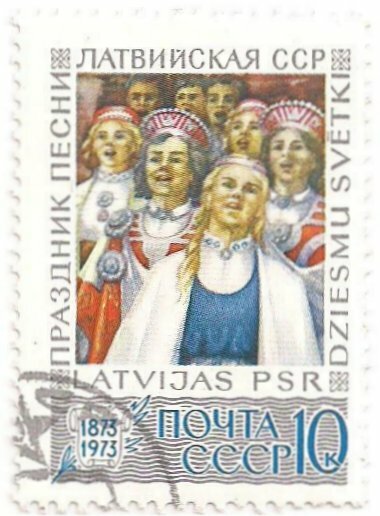 At the bottom is also the Latvian indication: Latvijas PSR, Latvijas Padomju Sociālistiskā Republika. 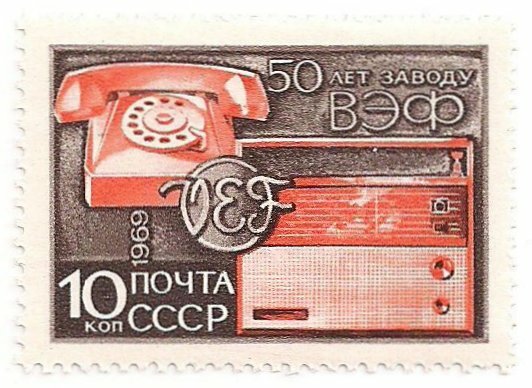 In German: the Latvian SSR, the Latvian Socialist Soviet Republic. The first postage stamp, mi. 1494, with the Union-building in Riga, Bruninieku straat, 29-31. Architect Ernest Stalberg, project 1927, but partly constructed. Built in 1930-1931 by the German architects Alfred Karr and Kurt Betge. Mi. 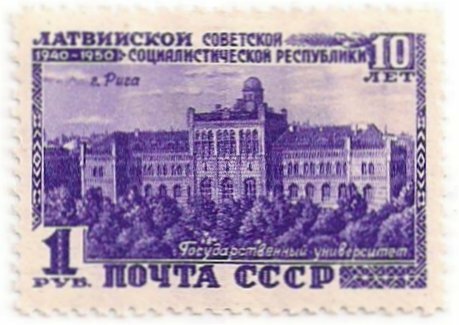 1495 with an image of the building of the Council of Ministers. 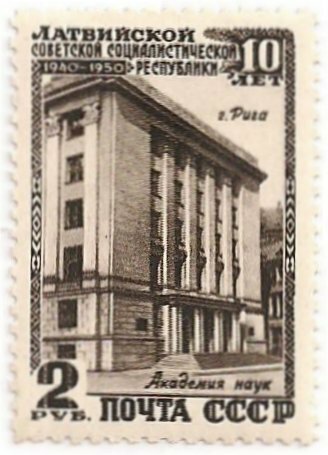 Now it is used as the Palace of Justice. Built between 1936 and 1938 as a new home for the Senate and the Ministry of Justice. Mi. 1496 with the burial monument of the Latvian poet Jānis Rainis (1865 — 1929). 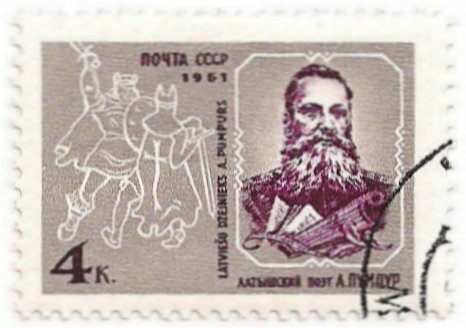 During the Soviet period, high-ranking Soviet soldiers were buried around the grave of Rainis. Mi. 1497 with an image of the Latvian national opera and ballet theater in Riga, built in 1863 and restored to its full glory in the 1990s. Mi. 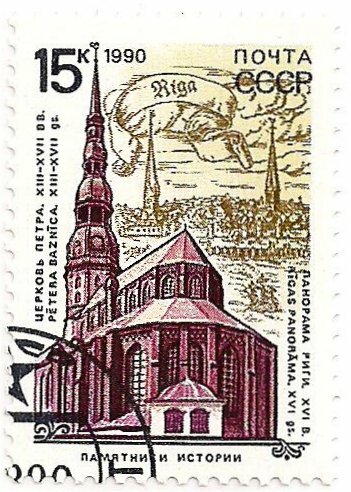 1499 with a picture of the Academy of Sciences in Riga. Here the old building. 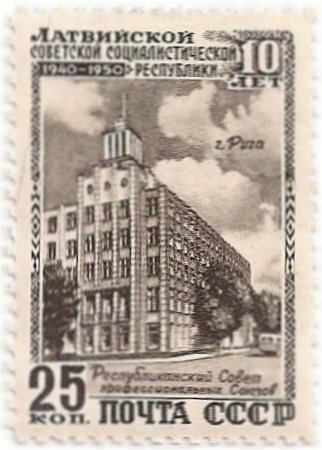 In 1951-1961 a new building was build in the ‘Stalinist architecture’ style. Latvian fair pavilion in Moscow: Vystavka Dostizheniy Narodnogo Khozyaystva (VDNKh) Russian: Выставка достижений народного хозяйства, ВДНХ. 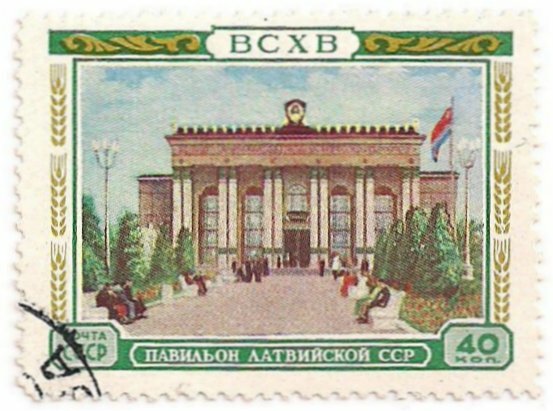 In 1935 established as Agricultural Exhibition of the Whole Union. The exhibition buildings were built in the period 1935-1939. Between 1948 and 1959 everything was renovated and in 1954 the first exhibition was held since the war. Still as an agricultural exhibition. 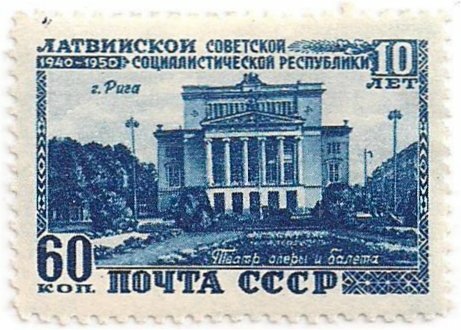 In 1959 the park was renamed: Exhibition of achievements of the national economy ( Russian: Выставка Достижений Народного Хозяйства , Vystavka Dostizheniy Narodnovo Khozyaystva) or ВДНХ / VDNKh . 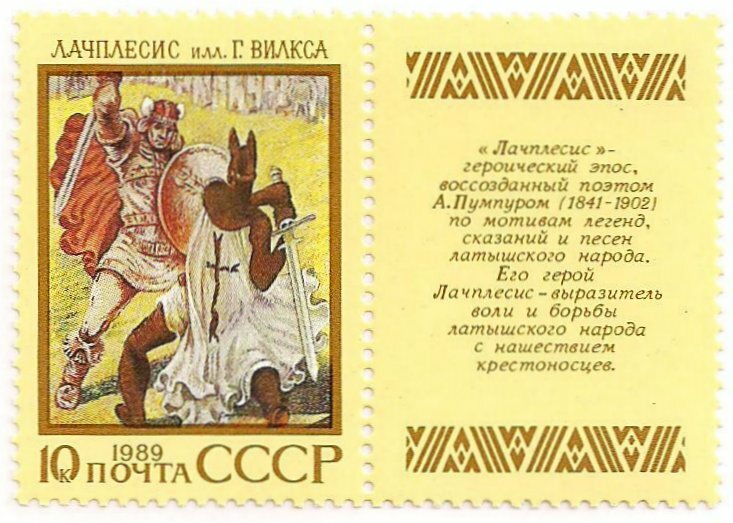 In 1992 VDNKh was renemed in the new acronym VVC and in 2014 the old name returned: ВДНХ / VDNKh. A view of Riga from the river in the series Capitals of the Union Republics (I). 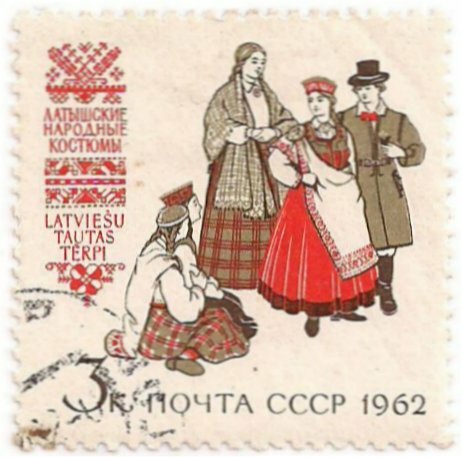 Latvijas Padomju Sociālistiskā Republika, Latvian Socialist Soviet Republic, the Latvian SSR. At the bottom of the postage stamp: РИГА ВИД С РЕКИ ДАУГВЫ, Riga view drom the river Daugava. 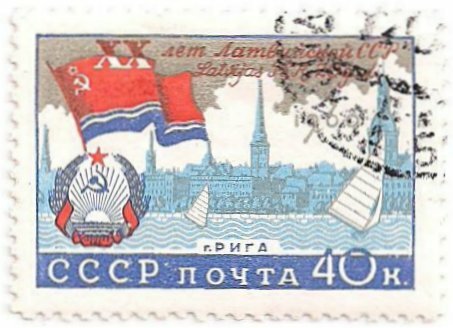 A view of Riga from the river in the series of Union Republics (IV), 20 years of Baltic Soviet Republics and Moldovan Soviet Republic. Г. РИГА, Город РИГА, city Riga. Andrejs Pumpurs (22 September [O.S. 10 September] 1841-6 July [O.S. 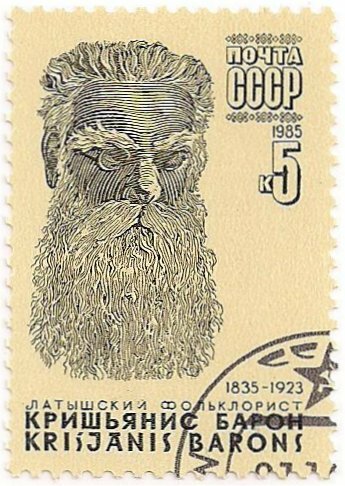 23 June] 1902): Latvian poet. 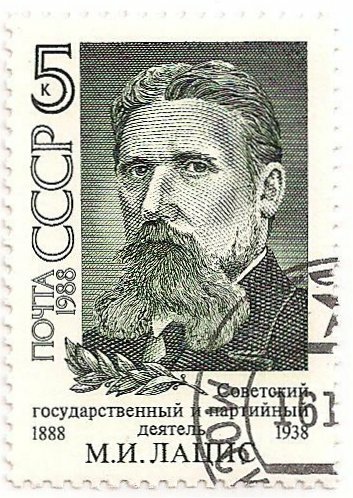 The well-known epic Lāčplēsis (1888) is from this poet. 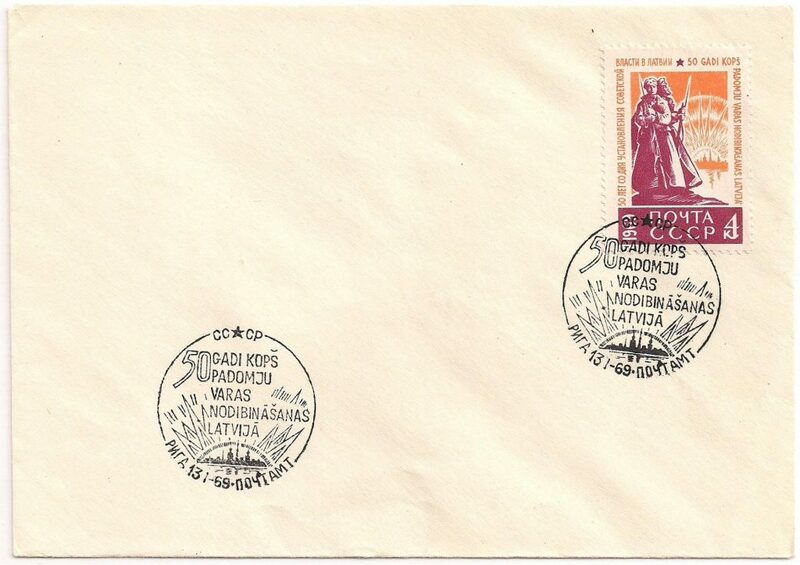 Letter with Michel 2734 and commemorative stamp Riga. 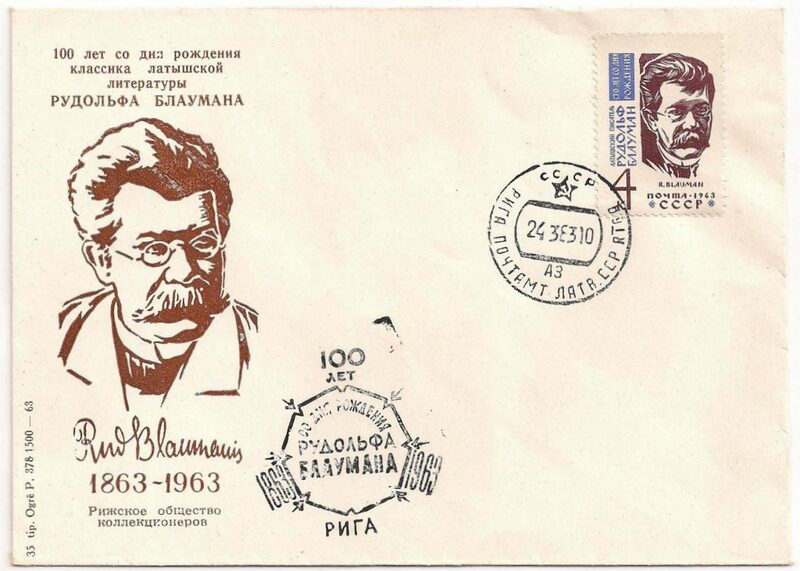 Postage stamp with a picture of the Latvian writer Rūdolfs Kārlis Leonīds Blaumanis (1862–1908). He is considered one of the greatest Latvian writers. See Wikipedia. 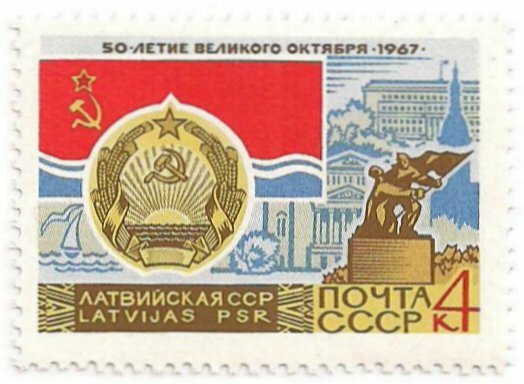 25 years Baltic Union republics (III): Latvian Soviet Republic. 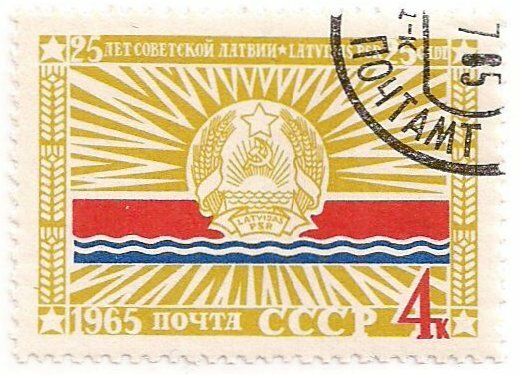 Postage stamp: flag and coat of arms of the Latvian Soviet Republic in a aureole. 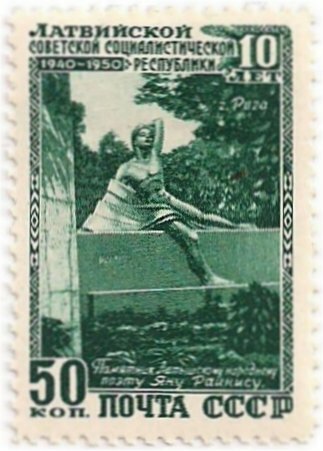 Postage stamp with an image of the Latvian poet and politician Rainis. 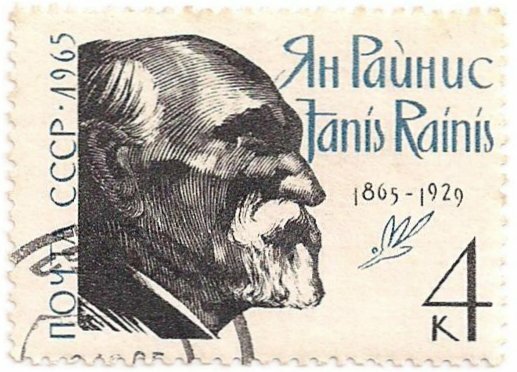 Rainis was the pseudonym of Jānis Pliekšāns (11 September 1865 – 12 September 1929). 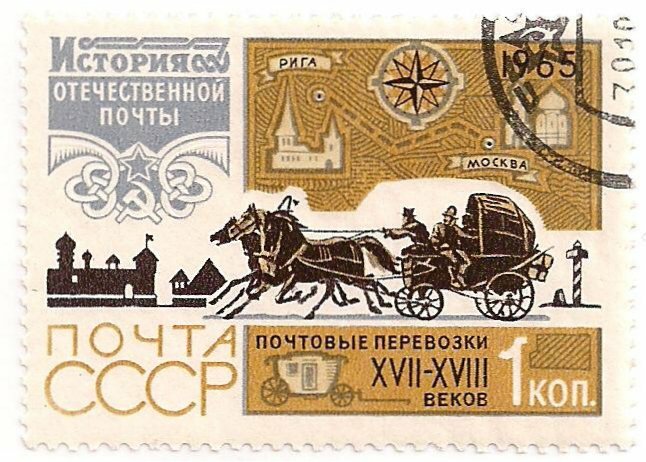 Post route Moscow-Riga (1665). Picture: mail coach 17/18e eeuw. Series Heroes of the Soviet Union (XII) Partisans: Imants Sudmalis (1916-1944). 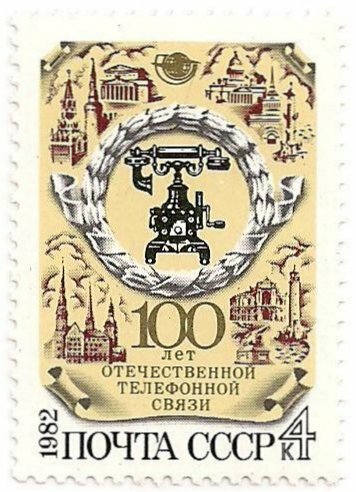 Born 18 March 1916 (old style calender) in Cēsis, Latvia. 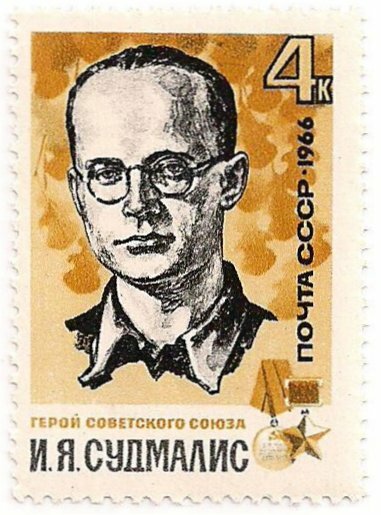 Executed by the Germans in Riga in 1944. 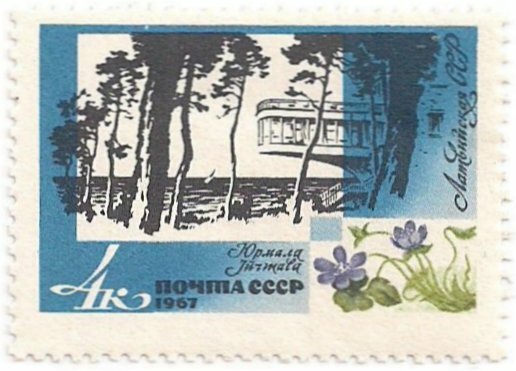 Postage stamp with a picture of “Juras Perle”, Sea Pearl, a famous restaurant on the beach of Bulduri. It was built in 1965, the architect was Josifs Goldenbergs. On the first floor was also a night-bar. Unfortunately, the restaurant burned down in 1991. In 2001 the remnants were removed. In the series Health resorts on the Baltic sea coast. 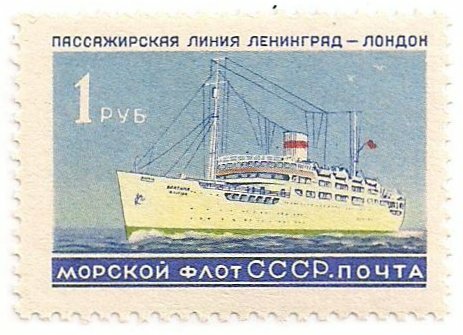 Postal stationery, issued 11/V-71, additional franking with Mi. 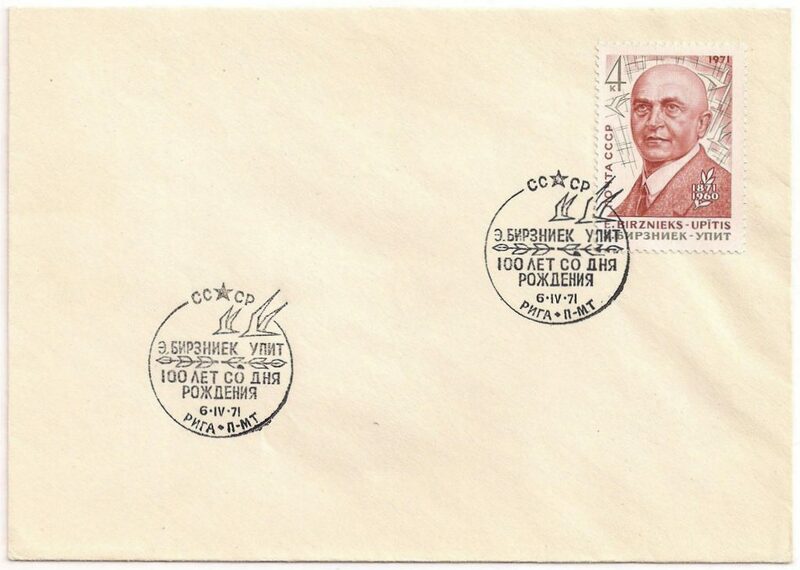 3889 (issued 1971, June 21), with commemorative postmark of Liepāja. 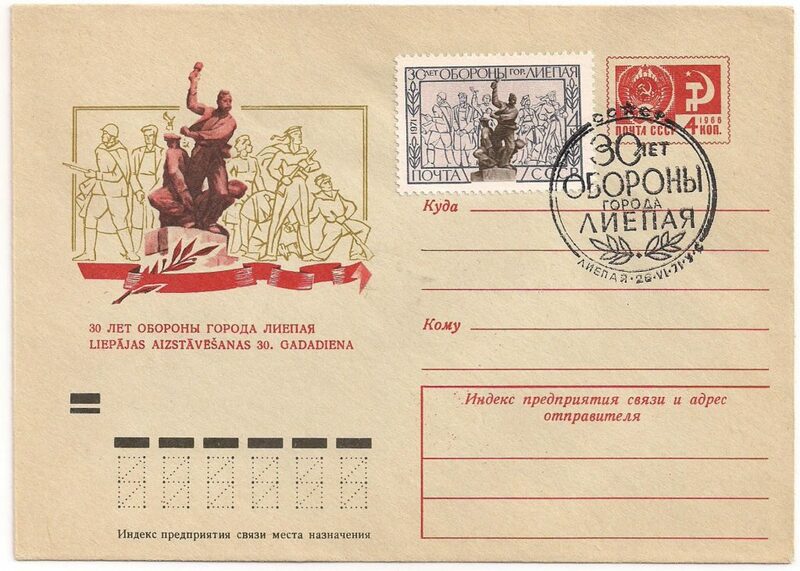 The stamp and the postal stationary were issued at the 30th commemoration of the defense Liepāja in the Second World War (June 1941). The monument, a bronze statue of two freedom fighters and a woman, is dedicated to those who fought in June 1941 against the invading Nazi army. The architect of the monument was Janis Līcis. The designer was Vasilijs Liekne and the sculptor was Egons Zvirbulis. Flags. 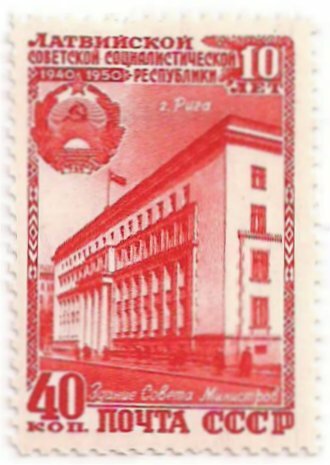 Left side: 2nd flag from above is the flag of the Latvian Soviet Republic (in use 1953-1990). Left side: 3rd flag from above is the flag of the Lithuanian Soviet Republic (1953-1989). 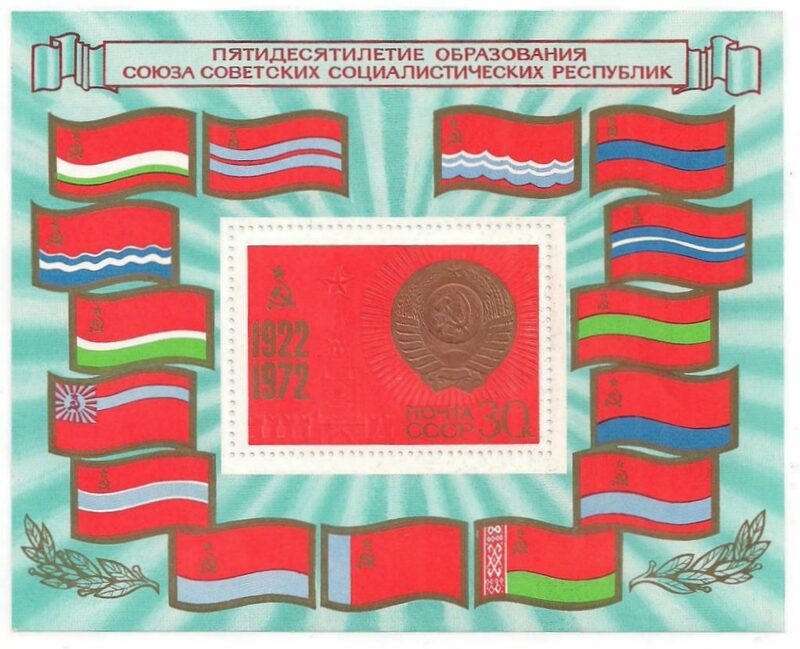 Upper row: 3rd flag is the flag of the Estonian Soviet Republic (1953-1990). 100 years of Latvian Song Festival. The tradition of song festivals originated in the first half of the 19th century in many European countries and later was also organized by the Baltic Germans. 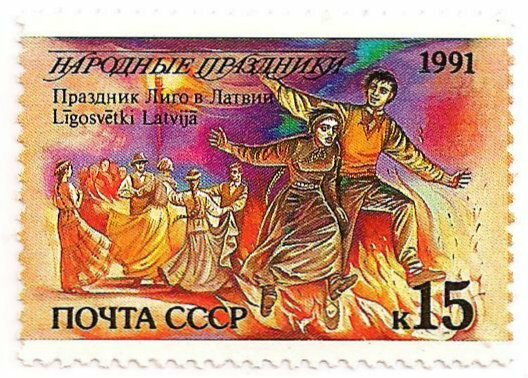 The first steps taken in Latvian environment was during the song days in Dikļi in 1864, which led to the resounding of a full-scale Song Festival in Riga during the summer of 1873. 1003 singers and 30 orchestra players participated in the first festival. Only once festival was held outside Riga- in Jelgava in 1895. In the series of buildings in the Baltic states: Riga. In the series History of Russian aircraft construction (I). Plane No. 2 by Jānis Steglavs (1870-1944), Latvian businessman from Jelgava and aviation pioneer. He moved his company (metal) to St. Petersburg and became rich there. His first plane ‘Dubbeldekker nr. 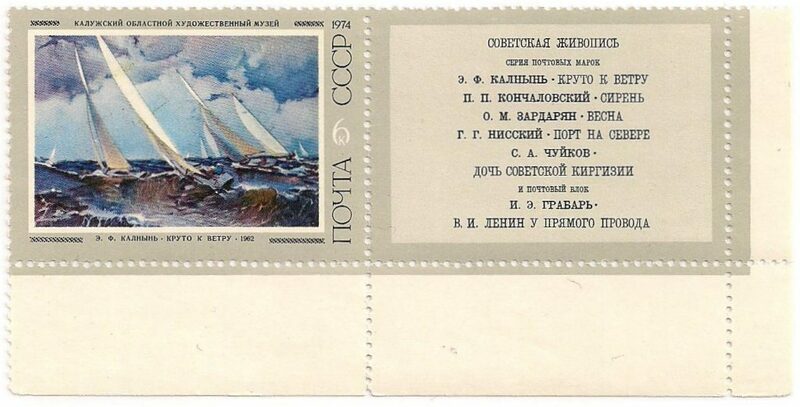 1’ took part in a design competition of the Russian Ministry of War in May 1911. He learned to fly in this aircraft. Biplane No. 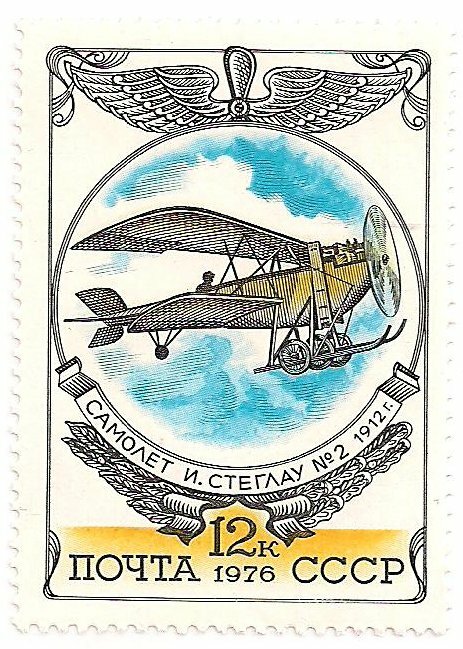 2 (on the seal shown here) was flown during the St. Petersburg competition in 1912 and was the fastest of the aircraft present. The plane has a top speed of 130 km / h.
In the series Union Republics (V): 40 years of Latvian Soviet Republic. 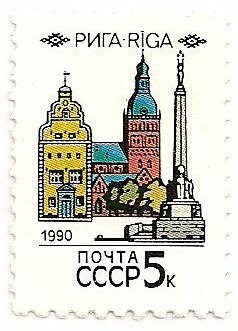 On the stamp: USSR flag, flag and coat of arms of the Latvian Soviet republic, monument of the Latvian gunmen, revolution museum, former powder tower. 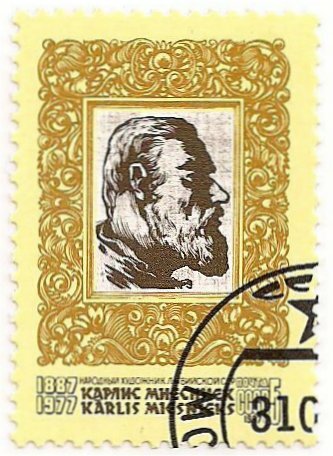 150th birthday of Krišjānis Barons (1835-1923), Latvian folklore researcher. He is best known for his work Latvju dainas (LD), published between 1894 and 1915 in six volumes. Herein: 217 996 folk songs. 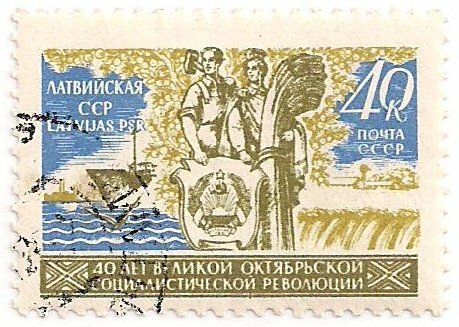 Series Epen of the peoples of the Soviet Union (III). The Latvian epic Lacplésis, the Bears killer, is written by Andrejs Pumpurs (zie Mi. 2565). The poem appeared for the first time in 1888. Series of historic buildings: Riga. 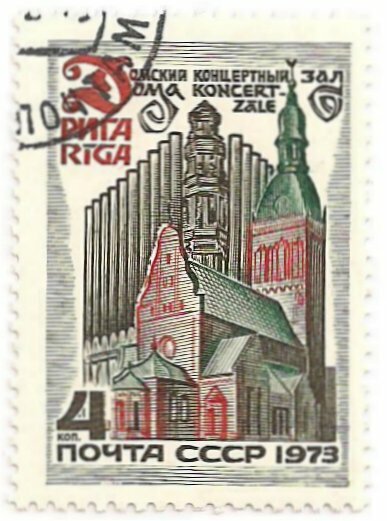 On the stamp you can see the St. Peter’s Church: (Latvian: Svētā Pētera Evaņģēliski luteriskā baznīca) a Lutheran church in Riga. The church is dedicated to Peter and is used by the Latvian Evangelical Lutheran church. See Wikipedia: Jāņi is an annual Latvian festival celebrating the summer solstice. Although the solstice usually falls on 21 or 22 June, the public holidays—Līgo Day and Jāņi Day—are on 23 and 24 June. The day before Jāņi is known as Līgo Day (formerly known as Zāļu Day).